November 21, 2011 - Gulfstream G650 received its provisional type certificate (PTC) from the Federal Aviation Administration. This clears the way for the company to begin interior completions of the ultra-large-cabin, ultra-long-range business jet in preparation for customer deliveries in the second quarter of 2012, as originally planned. The Gulfstream G650 is a twin-engine business jet aircraft under development by Gulfstream Aerospace. 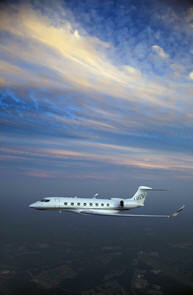 Gulfstream began the G650 program in 2005 and revealed it to the public in 2008. The G650 is the company's largest and fastest business jet with a top speed of Mach 0.925. "We are pursuing a two-step certification approach to keep us on track for our planned deliveries in the second quarter of 2012," said Larry Flynn, president, Gulfstream. "With the PTC in hand, our plan is to move production aircraft into final phase manufacturing to ensure customer deliveries in the second quarter of 2012." PTCs have been common in general aviation programs over the past 15 years. Both the Gulfstream V and the Gulfstream G550 were issued PTCs before receiving full certification. The four G650 aircraft in the flight-test program have flown more than 2,225 hours during more than 675 flights. One of those aircraft has a fully outfitted interior, allowing the company to confirm weight projections and test new features, including its Cabin Essential? design for redundant cabin systems. Seven production aircraft have flown in preparation for their induction into final phase manufacturing. More than 20 aircraft are in various stages of initial or final phase production. Among its achievements, the G650 has flown for more than 14 consecutive hours, with flight test data confirming its ability to achieve 7,000 nm (12,964 km) at Mach 0.85. The aircraft has also demonstrated 5,000 nm (9,260 km) at Mach 0.90. With a top speed of Mach 0.925, the G650 is the world's fastest civilian jet. "The G650 will exceed the capabilities of anything on the market, flying faster and farther, with industry-leading fuel efficiency and reduced emissions," Flynn said. The aircraft controls will be completely fly-by-wire, with no mechanical control between pilot and flight surfaces. The surfaces will be moved by a dual hydraulic system. More airliners today are using fly-by-wire, but only one current business jet (the Falcon 7X) is so equipped. The G650 will share yoke and column with the G550 in an effort to receive a common type rating. On April 2, 2011, a G650 test aircraft crashed after takeoff, from the Roswell International Air Center, New Mexico, killing the four people on board (two pilots and two test engineers, all from Gulfstream). The aircraft was conducting a takeoff-performance test with one of the two engines turned off, simulating an engine failure. It became airborne briefly at a high angle of attack before its right wingtip hit the runway, then slid on the ground and caught fire. The accident remains under investigation; its cause has not been determined.